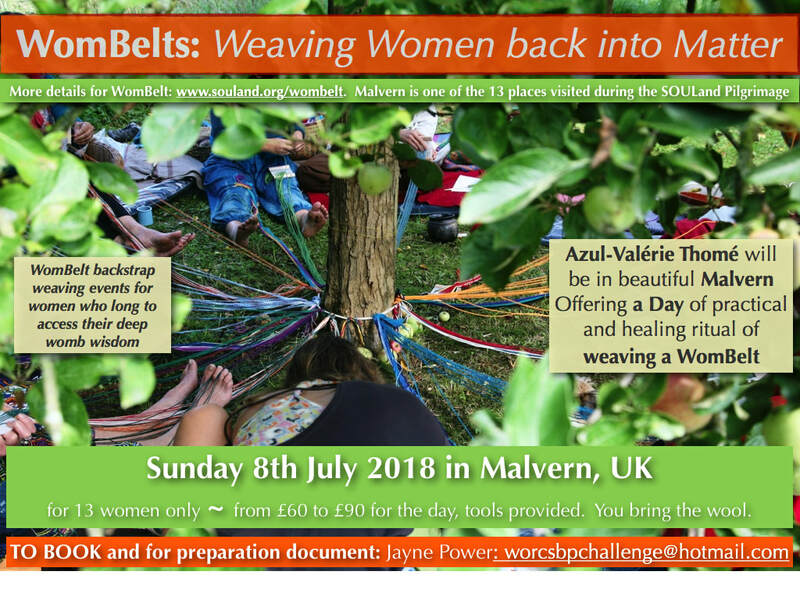 You are invited to participate in a day of ritual creating a WomBelt on Sunday 8th July at the Scarlet Sanctuary, Malvern, Worcestershire - only 13 women, so don't miss the opportunity of this wonderful offering. 'For those interested in participating in this wonderful workshop please do book a space as soon as possible (13 women maximum) so that we can make travel plans (also for Azul to travel back to the UK from Slovenia, where her SouLand Pilgrimage finds her presently), as well as sending you the 'Preparation' details necessary before the workshop. to book please email Jayne Power: worcsbpchallenge@hotmail.com and she will send details on how to pay, the investment being between £60-£90. A deposit of £25 is required to secure your place, thank you! During the SOULand Pilgrimage 2018 Azul will be travelling and offering SOULand spaces and practices, workshops and trainings for the care and maturation of our human Soul through Grief Composting Circles, eARTh, WomBelt and conversations with Grief, Love, Death and Life woven into Beauty and Imagination.